Where a component has a series of circles or arcs cut into it which themselves form a circle, in the same plane, can be done by mounting the workpiece on a rotary table that is itself mounted on another rotary table. There are two different ways this can be done. The first is where both rotary tables are horizontal. This is described here. The second is where one is horizontal and the second is mounted vertically on it. An example of this would be a series of circular slot cut into a circular plate. Curved metal plates are fitted into these slots and soldered in to form the rotor of a compressor wheel. A similar component would be a contrate gear wheel as used by Richard of Wallingford in his famous clock. In general, this is more easily arranged if the top rotary table is smaller than the bottom one because the top one has to be smaller for it to be possible to clamp it onto the bottom one. It might seem that the top one then provides the “smaller” motion and the bottom one the “larger” motion but, in general, the top one will be the one that performs the rotation require to turn the whole wheel by one revolution. The bottom rotary table will perform a large number of relatively small motions. An example of this is the compressor wheel described in “Gas Turbine Engines for Small Aircraft” by Kurt Schreckling. It will be seen from the drawing on page 85 that the curve of the blades is very nearly part of a circle. This can be machined using two rotary tables as shown. 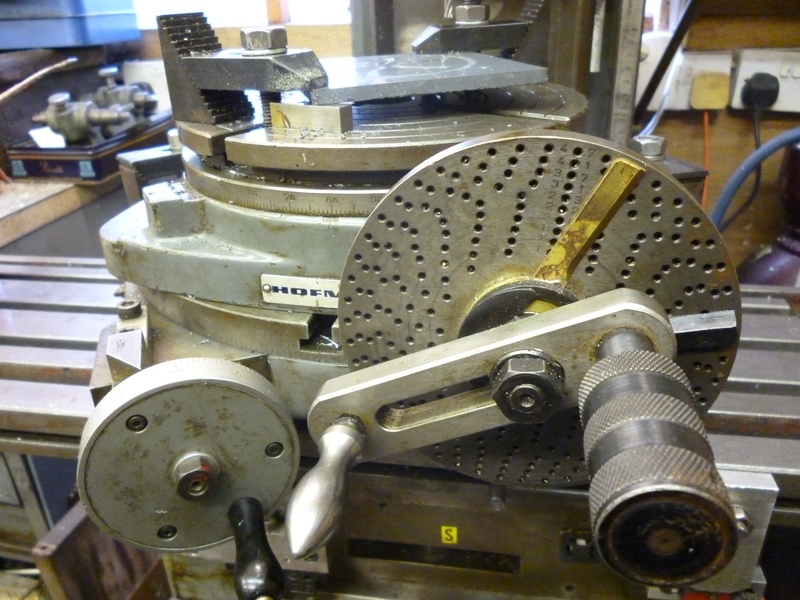 The bottom rotary table moves clockwise/anticlockwise to produce each slot in the wheel. The top rotary table holds the compressor wheel and rotates a whole 360º during the machining of the compressor wheel. 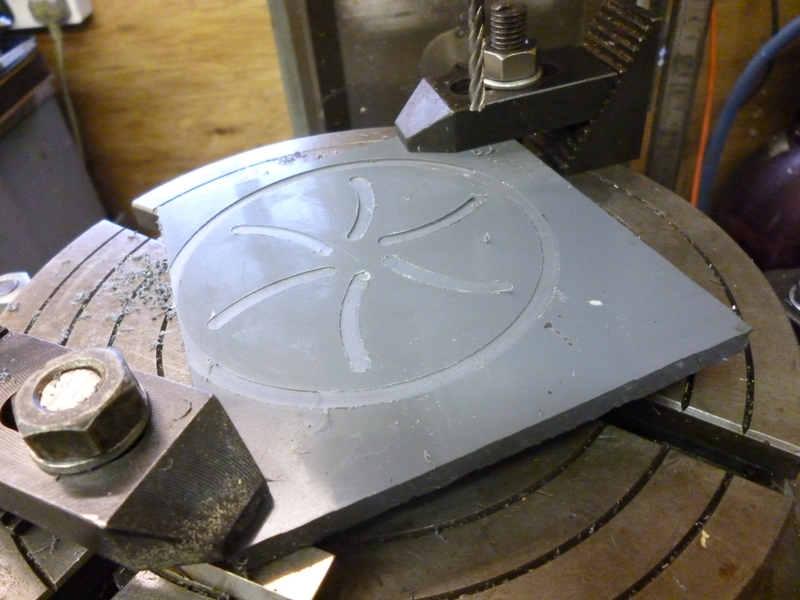 The top rotary table happens to be one with a flange on either side for clamping it to the milling table. But in this case it is clamped to the rotary table underneath. It can be seen that this is made much simpler by being able to clamp it anywhere along the flanges. 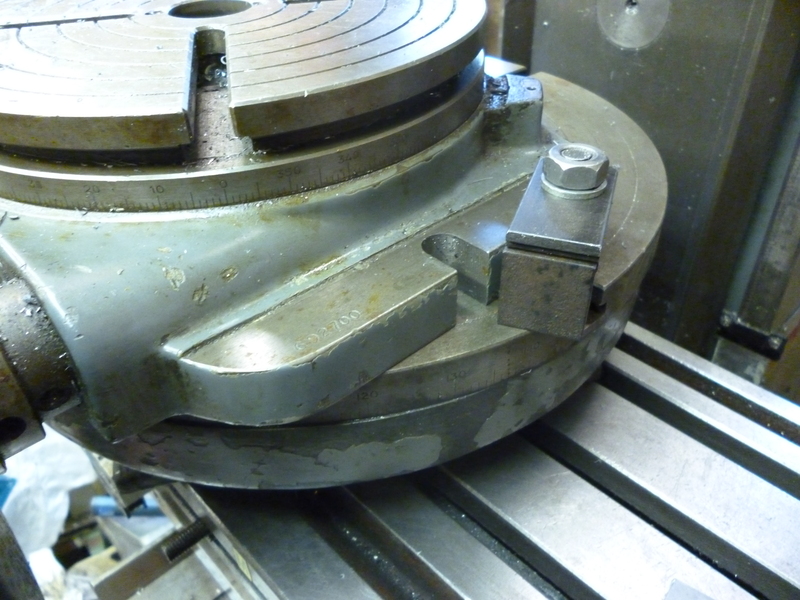 This combination will allow for the machining of circular shapes round the edge of another circular shape. Whereas in the preceding case the curves where in the same plane as the wheel this would give curves round the edge on a wheel. This would usually be easier using a dividing head mounted on a rotary table.